I wasn't the only one strolling about the garden this morning, checking on things. This assassin bug family was out there too. 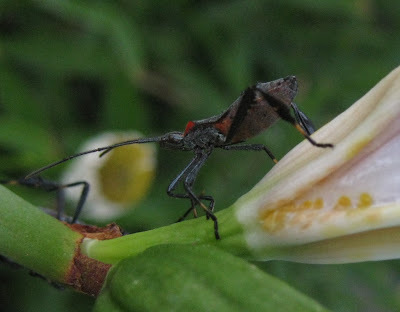 Assassin bugs are considered beneficial insects and will eat many other insects in the garden, although they are indiscriminate feeders and will eat good insects as well as those you want them to eliminate. They will also bite humans so it is best not to try to handle them. Although they have wings they are poor flyers and will scramble about in the foliage looking for their dinner or, in this case, breakfast. There are many types of assassin bugs; adults are usually brown or black and the nymphs are often more brightly colored, as seen in the top photo. I left them to enjoy their outing and hope they had as pleasant a time as I did in the cool morning air. I do hope they had a hearty breakfast. They are good looking tiny creatures. hahaha! the bugs... seriously, nice captured. I always forget what those critters are. I don't think I've seen any lately, but it's been so hot, that I'm only out for an hour or two in the mornings. I do pop out for 5 minutes at a time to see the butterflies, though.